English author; born in London 1795; died at Liverpool 1860. He acquired considerable reputation as a Hebrew scholar and an authority on rabbinical literature. While at Liverpool he published an "Address to the Missionaries of Great Britain," a forcible protest against the attempts of conversionist societies to entice Jews from their faith. He wrote also a pamphlet on the position of Jews in Great Britain, and was one of the editors of a monthly magazine entitled "The Cup of Salvation." 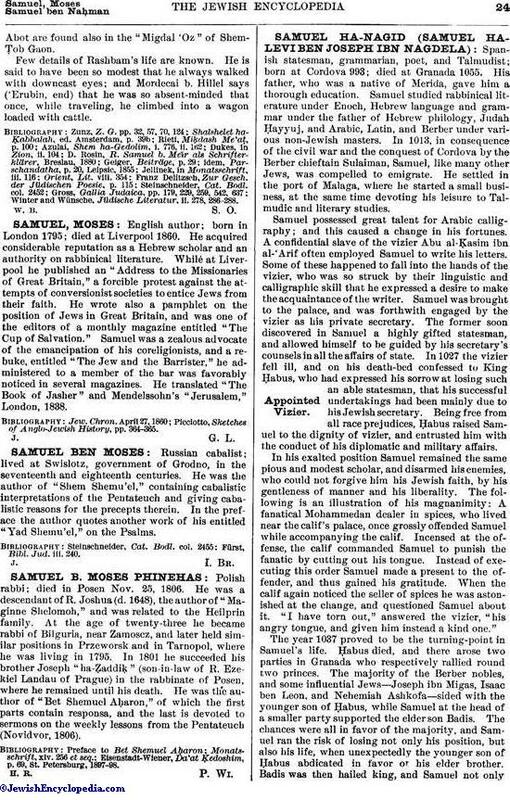 Samuel was a zealous advocate of the emancipation of his coreligionists, and a rebuke, entitled "The Jew and the Barrister," he administered to a member of the bar was favorably noticed in several magazines. He translated "The Book of Jasher" and Mendelssohn's "Jerusalem," London, 1838. Picciotto, Sketches of Anglo-Jewish History, pp. 364-365.